Did you know your cat will have an undiagnosed Urinary Tract Infection at least once in their lifetime? Cats will also have at least 2 UTI’s in their lifetime you may recognize the signs of! Cats with any types of allergies, food sensitivities or stress are at very high risk of UTI Blockages! Feline UTI’s are very dangerous as a cat’s body is designed to heal super-fast, yet do not give time for the body to clear the bacteria. UTI’s in cats more often end up Chronic. One day they can be fine and the next they’re blocked. It is crucial that a professional, pet sitter keeps an eye out for signs of a UTI when you are away traveling. A neighborhood child or “hobby sitter” most likely will not recognize the subtle signs of a feline UTI. UTI blockages are life threatening. The sooner you see the signs: struggling to urinate, the absence of urine, increased presence of tiny urine voids, spending increased amounts of time in the litter box and having accidents outside the litter box are some of the warning signs. These signs signal an immediate trip to the veterinarian is in order. A professional, pet sitter will alert you to the situation immediately. The causes of UTI are usually bacteria related and many such as improper ph balance can come from inside, outside, poor nutrition, cheap foods, not enough water intake, dirty litter pans and more. This is why we are talking about the importance of litter box maintenance. 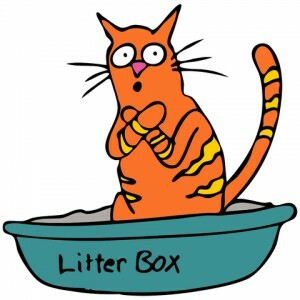 Any Litter that does not clump, breaks up easily or is not made for multiple cat households IS a HUGE pan of bacteria waiting to make your cat sick! Say NO To Scented Litters! Cats, by the very act of burying their potty, are continually breathing & ingesting the contents of their litter box. Heavily perfumed litters pose a very big health risk to our cats. Our culture is obsessed with convenient, perfumed items to make life easier and smell better, but at what cost? Think about your pet and what he can smell or accidentally ingest. Is it safe for them to be around? Nothing beats a litter box filled with a natural, non perfumed litter. Immaculate litter box maintenance will prevent your home from smelling like a litter box. Don’t mask a bad litter box maintenance issue with heavy perfumes. It is terrible for you and your cat. Hire a professional, pet sitter to maintain your litter box if you are unable to consistently maintain an immaculate litter box yourself. An ever increasing number of pet owners are risking their pets health by using pet care products containing perfumes, dyes and unnecessary chemicals. Remember it is your pet’s habit to investigate his surroundings through his sense of smell. Our pets have a lower profile and are closer to the ground than us. Even scented oil dispensers that plug into the wall can harm them! Consult your vet or professional, pet sitter for suggestions as to what products are safe for your pet. Cats prefer clean litter pans with lower sides having multiple ways to escape, placed in quiet, private spaces with moderate light. For health reasons they need the litter pan to be cleaned twice a day and maintained with a sufficient level of fresh litter. This keeps bacteria at a lower level. Let me know how I might help you with your litter box maintenance!!! Previous PostScooping Poop Isn’t Rocket Science & Hiring a PROFESSIONAL Pet Sitter Doesn’t Have To Be Either!